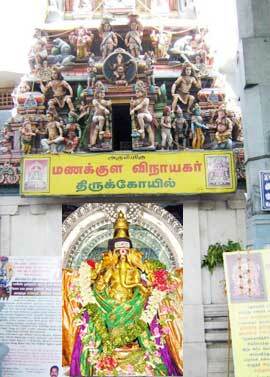 Manakkula Vinayagar Temple, dedicated to Lord Ganesh, is located behind the Raj Niwas in Pondicherry town. The temple is assumed to be constructed nearly 5 centuries back. The Vinayaka, called as a Vellakkaran Pillai, in the sanctum is a grand figure. A major draw is on the 18 day celebration of Brahmotsavam. Other festival celebrated here with piety and enthusiasm is Vinayaka Chaturthi. Prior to French regime, the temple is now was called weaver�s street and was renamed as Orlean street by them. This place was also part of the town where French and white people lived. They made every effort to remove the deity from this place and went even to extend of throwing the deity in sea and every time he came back to the same place, where the temple is now. Later the temple was built near the Bay of Bengal shores as per the Ganapathy Agamam and was named Bhuvanesa Vinayagar Temple. Presently the temple is built in 7913 sq. ft. with outer mandapam, Raja gopuram, Kodikambam (18ft tall gold plated), front mandap, Mahamandap, Sanctum, walk around area, other deity prahara, kitchen, office, Urcharvar deity, Marriage Hall, Inside the temple, the presiding deity placed in Karuvarai area 4 X 4 square place as the sanctum and the Vimanam above covered fully with gold plated. The presiding deity Moolavar in Sanctum blesses his devotees with four hands, the top two holding Angusam, Pasam and the right lowe hand with abayadana muthra and the left one varadhana muthra. On the north side of the sanctum, Komugi is kept for abishega water will come out and a small temple for Sandikeswarar. 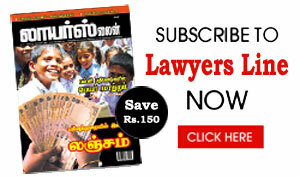 On the southern side, pragara for walk to go to round the ardhamandapam and Sanctum area about 106.56 sq. mt. donated by the Mother of Sri Aurobindo Ashram for extension on 25.12.1968. Now, on the western side of the pragara on the left hand side Sri Bala Vinayagar temple below the silver vimana and on the eastern side of the pragara on the right hand side Sri Balasubramaniar temple below the silver vimana were found. Next to north pragara entrance on the right hand side is Marriage Mandap, the place wherein used for all kind of poojas, homams and Brahmothsavam and Pavithrothsavam were performed to the Urchavamurthy, during the festival days. Different kind of vahanas kept safely at vahana Mandap nearby the temple. The Manakula Vinayagar Temple is one of the famous ancient temple is in Puducherry, a Union Territory situated in the southern part of Indian sub-continent. The temple is 400 meters West of Bay of Bengal Sea, 165 Km South of Chennai (Capital of Tamil Nadu State), 23 Km of North of Cuddalore and 35 Km East of Villupuram, TamilNadu. The main deity �Sri Manakula Vinayagar� (Pranavamurthy) of this temple is facing east and the temple is bordered on east by Orlean Street (Now Manakula Vinayagar Koil Street, south by Jawaharlal Nehru Street, north by Law-de-Louristhon street and west by a canal running north-south.